saha are pleased to announce that we have been rated as the 41st best not for profit company to work for in the UK following the 2018 best companies survey. 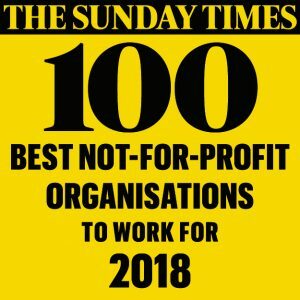 The Sunday Times list of the 100 Best Companies to Work For is compiled from the views of employees and the policies of employers. It identifies best practice defined by performance in eight key indicators of workplace engagement, covering staff opinions on their leadership, their manager, immediate colleagues, pay and benefits, wellbeing, the firm’s willingness to give something back, people’s personal development and overall sense of affiliation with their employers. saha’s simple but powerful statement reflects the essence of what our organisation is about. For us, transforming lives is about meeting the whole needs of individuals physical, mental, moral and spiritual. We adopt an advantaged thinking approach to transforming lives that focuses on people’s talents and future potential rather than past problems. We believe this approach helps to differentiate us from others and also breathes new life, innovation and creativity in how we work and provide services. Our social business is complex and evolving. Meeting the whole needs of individuals is now more than just about the provision of housing and personal support. Whilst our services, tailored programmes and this strategy set out how we strive to meet the whole needs of individuals, the ultimate outcome for us will always be about transforming lives. Congratulations to all of our staff on this fantastic achievement!